Alrighty today saw me hit up more of the music parties than some of the panels. I wanted to go to a songwriting panel but they A) moved it on me and B) ended up cancelling it. Oh well. What I’ve learned down here more than anything else is that you just need to keep moving. 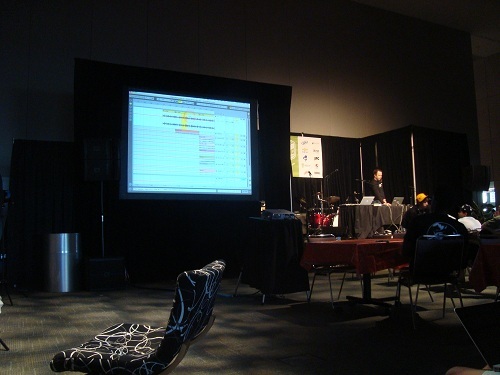 The one event I did make was the Ableton Live demo. Basically, the product guy from Ableton Live showed off some of the cool features of the program. What I learned was not only does Ableton do a great job of layering live elements, but it can also switch to a linear view to edit in a more traditional DAW style. I also got some info about the APC40 and will be doing some research on it when I get back. That’s about it for the panels today. Check my music blog for the show run downs.